Great eats, historic inns, stunning views. The only thing you won’t find in this NorCal seaside town is cell service. And that’s the point. Christopher Hall takes us to Mendocino. In for the krillThe ocean bluffs of Mendocino Headlands State Park offer VIP viewing to the best show in town this month when migrating gray whales journey from Baja breeding grounds back to Alaska. “They stick fairly close to shore,” says park ranger Dave Rodrigues, “and you’ll sometimes see whole pods spouting less than a mile away.” Catch a glimpse at the Mendocino Whale Festival (Mar 5–6), where you can take a docent-led whale-watch walk before sampling chowders and sipping Mendocino County wines. More of a landlubber? Farther inland, Van Damme State Park’s Fern Canyon Scenic Trail runs 3.5 miles long, passing through lush redwood forest (home to five owl species) and crossing nine bridges as it follows a creek where river otters are known to frolic. It takes a village to feed youCafe Beaujolais achieved near-legendary status after Margaret Fox took over the farmhouse turned restaurant back in 1977. Four decades and several owners later, its Cal-French mojo still works with dishes like pan-roasted California sturgeon with a truffle emulsion, and bouillabaisse brimming with fresh seafood. A few blocks away at Trillium Cafe, the menu might include grilled wild-mushroom flatbread, local albacore, and a creamy Meyer lemon tart. Two streets over, GoodLife Cafe and Bakery serves sweet treats but also a great selection of lunch dishes, from Cubano panini and pesto-spinach-mushroom quiche to soups like poblano-corn chowder. 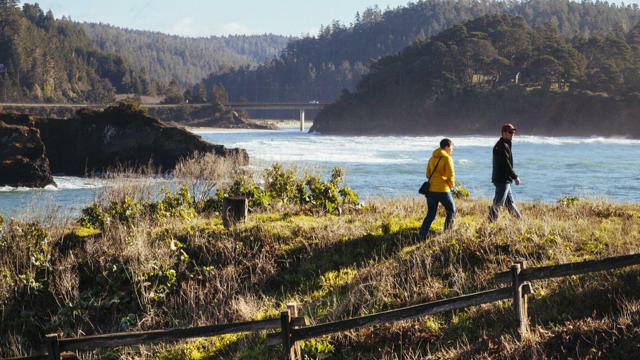 The path of historyJust how did Mendocino get from rip-roaring, 19th-century lumber town to a nationally designated historic preservation district? Find answers at the Kelley House Museum, a trove of Pomo baskets, shipwrecked Chinese porcelain, and other curiosities. The museum’s docent-led walks around the town’s historic core include stops at the tiny 1854 Temple of Kwan Tai, and Father Time and the Maiden, a sculpture atop Masonic Hall, carved over a six-year period from a solid block of redwood. Souvenirs from nearHoney & Ro isn’t your average small-town emporium. Feather-light alpaca ponchos drape alongside comfy Turkish robes and hefty white-oak chopping blocks from local maker Million and Clark. “I wanted to create the kind of place that reflects the trends in the city,” says owner Robyn Leeds. Nearby, the decorative and fine arts at Highlight Gallery include elegant turned redwood-burl bowls and sleek chairs from North Coast woodworkers. Watch the wallsThe Mendocino Art Center has been a magnet for Northern California artists for years. “We started in 1959 in the refurbished carriage house of the old, burned-down Preston mansion,” says administrative director Celia Shelden. These days, there’s a ’60s-throwback feel to the complex of courtyards and weathered buildings, which hosts 150 classes each year—watercolors, jewelry—plus free monthly exhibitions that range from plein air paintings of the Mendocino Coast to Korean-influenced ceramics.